Your Cards, on Your Terms! Protect your debit cards through your mobile device by receiving alerts and defining when, where and how your payment cards are used – with CardValet® from Fiserv. * Available through HCCU. Alerts Help You Play it Safe! Payment cards offer both convenience and risk. CardValet manages the risk by allowing you to set the boundaries for your cards. 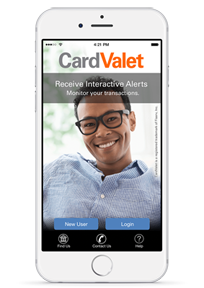 Choose CardValet to safeguard your cards from fraud with customized alerts and the ability to set limits on cards. *CardValet is powered by Fiserv, Inc. but is activated through Health Center Credit Union. There is no fee associated with the CardValet app. You are now leaving Health Center Credit Union's website. You are linking to an alternate website that is not operated by the credit union. The credit union is not responsible for content on the alternate site. Privacy and security policies of the alternate site may differ form those practiced by the credit union.